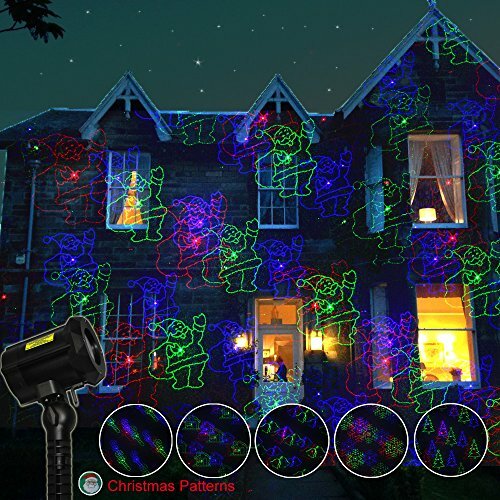 This laser lights is that it has both Christmas and Halloween decorations--it also has other star patterns too! This actually has pictures, not just lights. It has Santa, Candy Canes, Presents, Spider Webs, Happy Halloween, and a few more. There's no separate slides to change the pictures, it's all done with the push of a button! Just simply plug Poeland laser lights into a wall socket, mount it to the land, trees, grass, or any place like garden and yard, Star / Halloween / Christmas 3 models can be selected. You will love how fast you can get back to enjoying your holidays! Effects: Star / Halloween / Christmas 3 models, 18 Patterns, 3 Color, more than 1000 moving points. There may be a slight delay if operating below 32 Degrees F.
The included Radio Frequency remote lets you control your Laser Light from anywhere in and around the house . The built-in timer runs for 2, 4, 6, or 8 hours and is also control by the remote. Warning: Avoid direct eye contact. If you have any questions about this product by Poeland, contact us by completing and submitting the form below. If you are looking for a specif part number, please include it with your message.